NASHVILLE -- Offense usually comes at a premium for the defense-driven Nashville Predators. There's no 30-goal guy in their lineup; in fact, their leading goal-scorer had just 23 and their top point-producer had 50. "Well, we're going to need offense from everyone," Nashville coach Barry Trotz said two weeks before the playoffs were set to begin in addressing his team's offensive challenges in the postseason. The player whom Nashville had hoped to center its top line, Matthew Lombardi, only played in the first two games of the season because of a concussion. Center Marcel Goc played 51 games and then suffered a season-ending injury. Center Cal O'Reilly, a power-play specialist, and Steve Sullivan, an eight-time 20-goal scorer, have returned for the playoffs after missing long stints during the second half of the season. And so, perhaps not surprisingly, the Predators have called upon the services of a former Selke finalist -- Mike Fisher -- to center their top offensive line with their two leading goal scorers, Sergei Kostitsyn (23) and Patric Hornqvist (21). 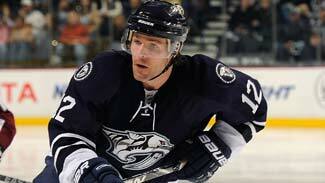 As one of Nashville's few players to have won a playoff round, Fisher will play an essential role for the Predators. "We want to go deep and we want to make a run," said Fisher, who went to a pair of conference finals and a Stanley Cup Final with Ottawa. "I feel like with the goaltending we have here, and our defense is really solid here -- our all-round game -- I really believe that we're a team that can do some damage. Teams really don't want to play us. Obviously there's no easy matches, and in the West there's so many great teams, but we have to give ourselves a chance and focus on that." As Trotz pointed out, Fisher is a "two-way" forward, which means offense as well as defense. He has reached 20 goals four times in his career and owns 14 career playoff goals in 75 games -- all with the Senators. The difference is that in Ottawa he was not counted on so much to score. When he chipped in, it was more like gravy on the poutine. Fisher's Ottawa teams looked for goal-scoring from such snipers as Jason Spezza, Dany Heatley, Daniel Alfredsson, Marian Hossa and Martin Havlat. Trotz said Fisher is "a guy who can play multi-faceted roles for us." One of them, Trotz hopes, is that of goal-scorer. Fisher went through quite a dry spell with Nashville -- 17 games between Feb. 19 and March 24 without a goal. He subsequently scored three in two games to break out. "It felt great," Fisher said a few days after scoring twice in a key 4-2 win against Dallas on March 26. "It's been a tough go. It's not for a lack of chances. The beauty of it is we have different guys chipping in every night. Our offense has been really spread out. That's really been the key to our success. But it was nice getting a couple and hopefully I can continue on and help this group offensively." Trotz said he thinks Fisher was pressing during his goal drought. "He probably says he wasn't, but he was pressing a little bit," Trotz said. "You don't want to go through a bunch of games and, not if you're in a fairly decent offensive role, you don't want to go long spells without being productive and he knows that. So I think he was pressing a little bit internally. Nothing you can really see. "I never complained, 'Hey, you've got to produce. You've got to do this. You've got to do that.' I knew he'd come around, he'd produce. If he gets hot at the right time it would be a real boost for us." Fisher, 30, who played all 11 of his NHL seasons in Ottawa until the Sens sent him to Nashville for a 2011 first-round draft pick and a conditional 2012 pick, admitted he went through an adjustment period, even though his wife -- country music star Carrie Underwood -- lives in Nashville. He said the Predators' tough road to the playoffs helped focus him. "It's strange the first little while," he said. "You play so long somewhere and there was no better place for me to go (than Nashville). Having it come in and be so easy to come in and already having settled here a little bit, I already spent time in the summer here. The guys were really good. Probably it took a few weeks and now it's pretty normal. But it still takes time." Systems-wise, Fisher said he had to adjust to a Predators system that was more up-tempo and aggressive than how he was playing in Ottawa -- this comes as somewhat of a surprise, considering Nashville's focus on goaltending and defense. Fisher said being in the playoff race made things fun for him; the day he was traded, Ottawa was 15th in the Eastern Conference and ended up missing the playoffs for the second time in three seasons. "Our group in general is well-balanced," he said. "We play a good, solid team game, but I feel like I can bring some experience to this group and chip in with some big goals, timely (goals), and just kind of play good at both ends of the ice. If I'm doing that -- moving my feet and playing with energy -- those things just seem to follow that. I'm hoping to step that up in the playoffs."